This entry was posted on January 8, 2017 by Ryan Curtis. Marimo Moss Ball – The 8th Wonder of the World? Where to start with the wonderful somewhat mysterious world of Moss Balls. They are naturally found in nature in places like Ireland, Japan, Estonia, and Iowa! One of the biggest things about Moss Balls is the fact that they are actually not a type of moss. Weird right? The Scientific name for for the “Moss Ball” is Cladophora Aegagrophil, and Aegagropila Linnanei. They are balls of algae and even though we see them in the bottom of most tanks, they are considered floating plants because they will not attach to anything like a real true moss would. They are probably on the top 3 list of easiest plants to care for. This is truly a no brainer plant as long as the plant keeper has a pulse and 5 minutes a month they can keep one of these babies alive! They do not require co2 or any added fertilizers. They can be grown in low light without real issue at all. They get their round shape from being turned in natural occurring currents however in your aquarium you will need to turn the moss ball over every so often to help it keep its round shape. Once a month you will need to squeeze them to get rid of all the particles and waste they have collected. They are considered by some to be magnets for waste. When placing one in your aquarium they will often tend to float, this is normal as once they become water logged they will sink to the bottom, this can take up to 24-48 hours. If you wish to speed up the process you can place them in water and squeeze them forcing them to take in water. After they have established themselves in your tank if they grow large you can simply cut it in half and now you have two moss balls! Cutting them will do no harm and they will simply start to grow again. If you are hoping to watch your moss ball grow easily in the low light, non co2, and non-added fertilizer you will not be pleased. As stated they will grow perfectly fine however the rate at which they grow will be incredibly slow… snail’s pace. 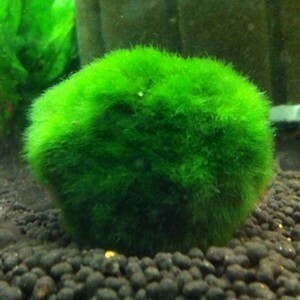 So if you goal to grow big moss balls, either buy them big or get some co2, high lights, and fertilizers. Shrimp love to graze on moss balls and will pick at them, however beware that Amano shrimp have been known to tear up moss balls. Overall they are a good addition to your shrimp tank and do nothing but benefit your tank and add beauty.